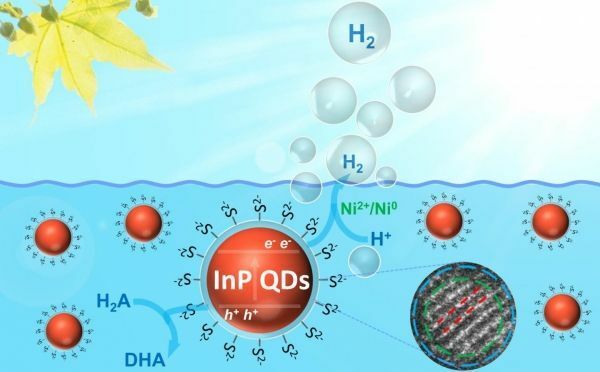 Researchers at the University of Zurich have developed a nanoparticle type for novel use in artificial photosynthesis by adding zinc sulfide on the surface of indium-based quantum dots. These quantum dots produce clean hydrogen fuel from water and sunlight – a sustainable source of energy. They introduce new eco-friendly and powerful materials to solar photocatalysis. Quantum dots are true all-rounders. These material structures, which are only a few nanometers in size, display a similar behavior to that of molecules or atoms, and their form, size and number of electrons can be modulated systematically. This means that their electrical and optical characteristics can be customized for a number of target areas, such as new display technologies, biomedical applications as well as photovoltaics and photocatalysis. Another current line of application-oriented research aims to generate hydrogen directly from water and solar light. Hydrogen, a clean and efficient energy source, can be converted into forms of fuel that are used widely, including methanol and gasoline. The most promising types of quantum dots previously used in energy research contain cadmium, which has been banned from many commodities due to its toxicity. The team of Greta Patzke, Professor at the Department of Chemistry of the University of Zurich (UZH), and scientists from Southwest Petroleum University in Chengdu and the Chinese Academy of Sciences have now developed a new type of nanomaterials without toxic components for photocatalysis.